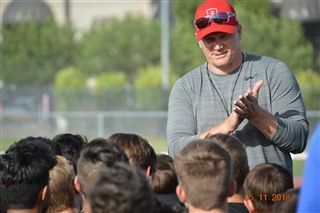 PHOENIX – [January 30, 2019] – Brophy College Preparatory head football coach, Jon Kitna, has announced he’ll be leaving after one season to take over as the quarterbacks coach for the Dallas Cowboys. Kitna is a former NFL quarterback who played for the Cowboys from 2009-2011. Kitna took over as head coach of the Broncos last summer and made significant strides with a coaching philosophy that stressed hard work, discipline, and character-building on and off the field. The Broncos went 7-3 during the 2018 regular season, at one point winning six consecutive games, then lost to Mountain Pointe in the first round of the 6A Arizona state playoffs. Principal Bob Ryan commented, “I believe the football program will continue to benefit from Coach Kitna’s contributions. We thank him, and wish him and his family well.” He added that the search for a new coach is well underway and he hopes to make an announcement within the next few weeks. Brophy College Preparatory is a Catholic, Jesuit school for young men, established in 1928, that seeks to instill competence, conscience, and compassion and to educate Men for Others. Educating Men for Others to serve the world.